Prices vary on extra-large sizes over 48" of any one dimension. Special sizes and large orders are no problem; please EMAIL US for fast pricing on cover sizes over 48" of any one dimension prior to submitting your order. Our Black, Green, Gray and Tan MARINETEX Fabric covers come with a 5 Year warranty. Our Light Gray, Light Green and Tan Superior Marine Canvas covers come with a 5 year warranty. High Quality, professional grade outdoor furniture protective covers have a modern, and attractive professional appearance. The safest, top selling, and most popular furniture covers since 1989. These are not cheap, thin (light weight) type covers! You can order either round, square, or rectangular or back to front angled designed protective covers. Our outdoor furniture covers will stand up to harsh UV rays and will not crack in harsh winter weather. Our protective covers are wind resistant, highly water resistant and are quickly installed over the top and sides of your outdoor furniture to protect the entire piece of furniture from harsh winter elements. 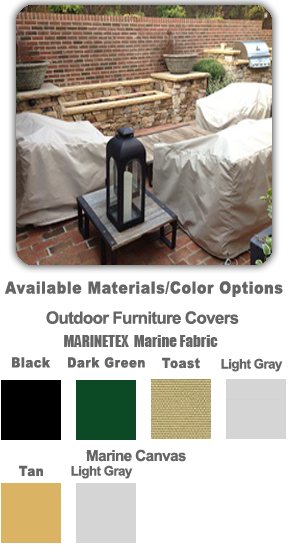 Our outdoor furniture covers have a 1/8 inch nylon rope tie sewn into the bottom hem. Product Features: Heat sealed 1/8” outdoor nylon rope tie ends with strong Barrel Lock/slide lock to cinch-up and tighten rope tie around unit being covered. Five year Straightforward Warranty on craftsmanship and material integrity. Prices vary on extra large sizes over 48" of any one dimension. Special sizes and large orders are no problem. E-mail us for fast pricing on cover sizes over 48" of any one dimension prior to submitting your order. 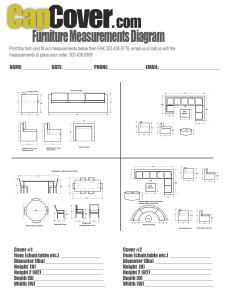 Print out the Measurements Diagram, fill out the measurements required, Send measurements via Fax or Email the measurements diagram as an attachment. You can also call in your measurements and place order with Visa, MasterCard, Discover or American Express credit card. Made of fabric that resists moisture and mildew and will not harden or crack. Beads water on contact and is virtually waterproof. Comes in black, gray, toast and dark green. Our most expensive and highest quality marine canvas material available in light gray, light green or tan in color. For those that want only the best in a heavy duty marine canvas cover.